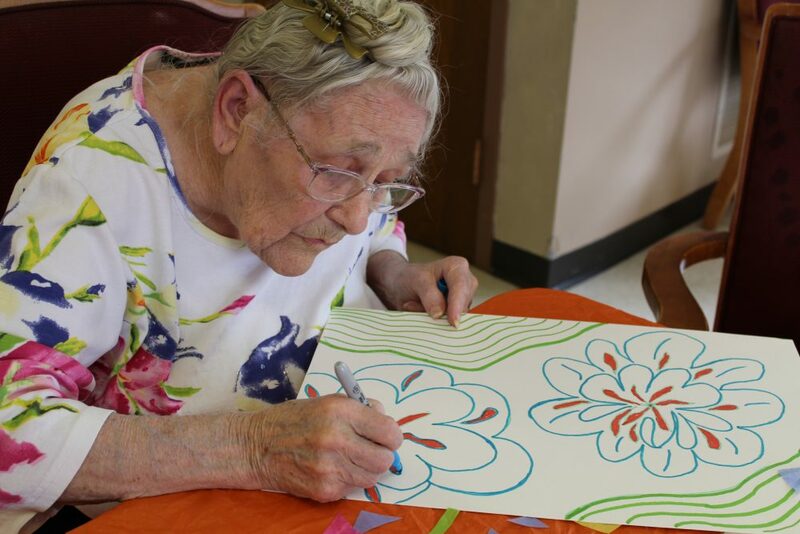 Following the philosophy of “aging in place” successfully, our Activities team understands that each individual resident has his/her own life story to tell. 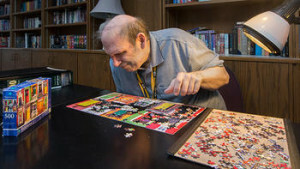 We celebrate those stories and ensure that activities that have been a part of their lives are available. We also try to introduce them to new ones! 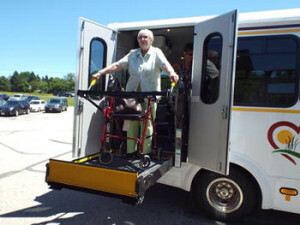 Our activities are reflective of individual needs and abilities. You will find group and individual activities that are both satisfying and enjoyable. Activities listed below are the backbone of St. Monica’s activity program. There are dozens of other activities, some are more individualized, and some are yearly/seasonal events. Many varieties of card games are played, several during the day, but most after dinner in the evening. Bring your luck, we supply the cards. Schafkopf anyone? 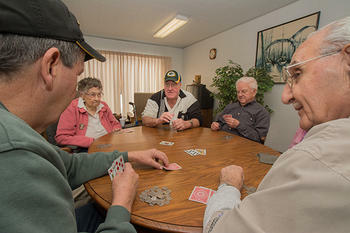 A local card game usually played for nickels, every Wednesday morning. 5 elected community members represent the general population to the head administrator and our Board Members Liaison. Meet and greet new community members and make them feel at home. Our community members meet with all staff supervisors once a month, for open discussion, thoughts and concerns. Community members send out encouraging words to those in need. Send out cheerful wishes on special occasion to community members and staff alike. Carol our cook bakes them and the residents decorate them, lots of fun for everyone. Bring your favorite recipes if you enjoy cooking, but, be prepared to eat what you cook! 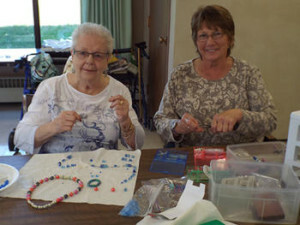 Very creative necklaces, bracelets and earrings, handcrafted by our community members. Whether you like self-expression or “staying” in the lines, you are sure to find enjoyment in this class. Sometimes, it is a little craftier but painting equipment and ideas are always available. This class is every Tuesday morning. Arts and crafts brought to a new level at St. Monica’s. Very good natured, and lots of laughing during this craft time. Usually held once a month. 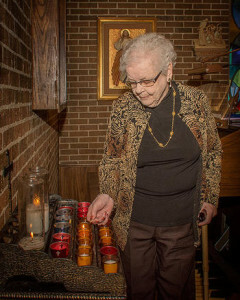 Sr. Clare encourages development of personal prose through a variety of writing experiences. Class is 45 minutes every Wednesday morning. Whether you need direction or like to write your own verse, this class is about self-expression. Sr. Clare is our playwright and we have a lot of fun with her skits. Usually once a week the newspaper is read aloud and the events are discussed. We encourage everyone to voice their views and opinions during this lively hour session. This group gets together weekly; usually a short story is read and participants are encouraged to share their memories and experiences. This is a terrific way to know your neighbors. We’ve taken current events to a whole new level. Our discussion leaders are well versed in todays politics. Once a month we go to a local restaurant. The location is based on popular demand. Big Band Dance Revue, Holy Hill, Farmers Market, Music on the Square, are just a few examples of our outings. We head out to Marcus Theatre once a month, on bargain Tuesday, you get a movie and popcorn for $5.00. 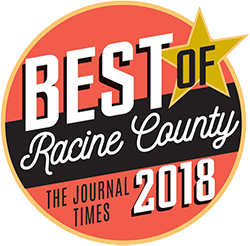 We enjoy going to Racine Theatre Guild for their musical programs whenever possible. We alternative between K-mart and the Dollar Store/Piggly Wiggly, grab your shopping list, we also shop various department stores as requested. We’ll provide the transportation. All of our exercises are done from an armchair, except for a few minutes of balancing. Tie golf balls onto strings and throw at a target; who would have thought this would be such fun. Three times a week balance control is incorporated into our exercise regimen. We put canes to a very different use, emphasis is on staying limber. 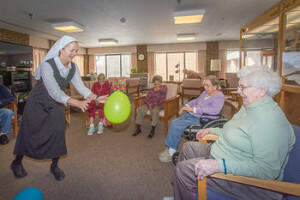 This is a once-a-week exercise using balloons that enhances hand-eye coordination; fun music and a lot of laughter. A gentle chair exercise every involving stretching of the major muscle groups; ½ hour duration time. Get there early to get your favorite card, this is a popular activity. There is no card fee and usually played 2-3 times a week. 3000-piece puzzle too big? No worries, we have any size puzzle you like. 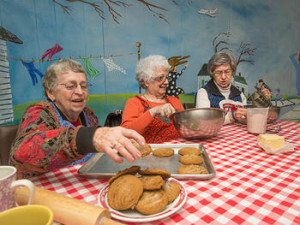 Different Church groups sponsor a bingo, and bring in home baked goodies to pass around, once a month. Also known as shut-the-box amended for our residents. This is a very popular dice game played several times a month. We’ve taken a bowling alley and shrunk it. It is a miniature bowling alley with a lot of skill involved. Played Monday afternoons. We don’t play for money, but there is a lot of laughter and groaning during our version of the this popular game show. Test your knowledge with clever clues once a month. Test your skills against other enthusiastic bowlers. Then invite the grandkids to a game or two. Open to community members every day. For those who miss golf we offer putting with your neighbors who also miss the game. 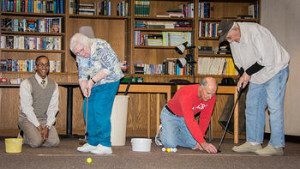 Our putting is conducted indoors once a month. If your vision is a little dimmed, you can still enjoy books on tape, which we facilitate your enrollment. What could be better than to have some coffee and read the daily news? Newspapers are usually found in the living room or coffee areas. Computer Station is stationed in one of our family rooms. Open to our residents for skyping, Facebook or Google searching. Located throughout the whole building, no need to sign out these books, take what you want and bring them back when your are finished. This interactive game keeps our cognitive abilities sharp through terrific games and mental exercises. No computer skill is needed, and we have someone available to show you how to play it. 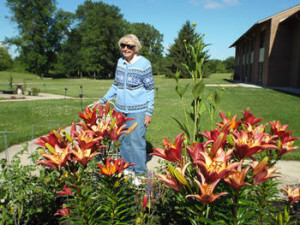 Racine public library brings a selection of large print books once a month. Library check out time is Tuesday afternoon. Conveniently located throughout our facility. 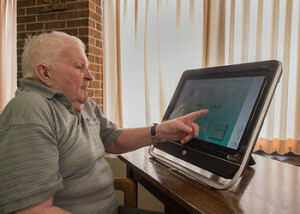 We have reading machines which enlarge print to make reading easier for those with limited vision. Place around the building for your convenience. All our lounges have a television. The one in the living is connected to NetFlix. Located on the lower level, pick out your favorite movie and watch with friends or in the comfort of your apartment. We have a couple of great guys who come in once a month, and as they say, “get the joint jumpin’”. Many and a lot of fun. You don’t need a “trained” voice for our gang. This is a very popular class for everyone. No musical skills needed. Class is conducted once a month. We have guest speakers, bands, instrumentals and vocalists throughout the year. We are blessed that many local school share their talented students with us as well. Very talented people come in and share their skills on the old ivories about 4 times a month. Each has his/her own style and each is just wonderful. Soft, gentle hand-over-hand calming motions. Twice a month our residents are treated to hand massages; it is a soothing experience. A luxury to have a licensed masseuse come here, for more privacy she can go to your room. If it’s Thursday our ladies know it’s nail time. They pick out their favorite shade and we paint their nails. This is a fun filled morning, coffee and chocolate always available. Located here on our premises. Whether a simple trim or more complicated permanent is wanted, Heidi is our go-to hair stylist. Every other month, no need to make a special trip out, we have a podiatrist who comes to our facility. If you like fresh vegetables, or simply enjoy flowers for their beauty, we have raised and traditional planting beds. Green thumbs are not required if you just like to help out. Our grounds were laid out with strolling in mind. There is no noisy traffic to contend with, it is serene and peaceful. Many days we have deer playing in our fields. Located a short stroll from our main facility, our gazebo offers a panoramic view of our grounds. 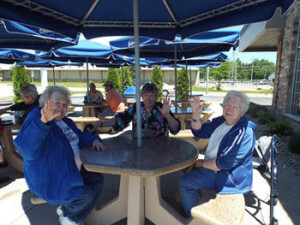 Tables and chairs are located inside the gazebo for game playing or refreshment serving. If your trousers are too long or you need a button sewed on, Maryann is our sewing expert. Maryann is available once a month, or by request if something special is needed. We supply sewing machines and the materials and our residents supply the talent. 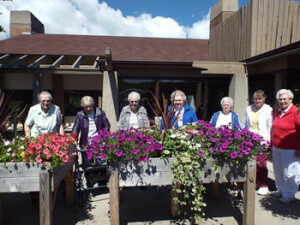 oor decorations, serviceable shopping bags, walker satchels, are among the few projects our residents have completed. 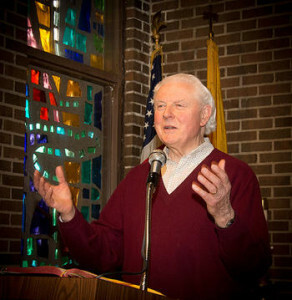 John Poorman chairs this discussion group, once a month. Let your request be known to one of the Sisters and they will make the arrangements for you. Every 1st Thursday Sr. Clare opens up friendly competition on the Bible, good questions and conversation. Great visiting and inspirational speaking with lively music to boot. Usually the 4th Tuesday of the month. Catholic Mass usually said every morning at 8:30. Protestant services are held every Thursday at 10 am. 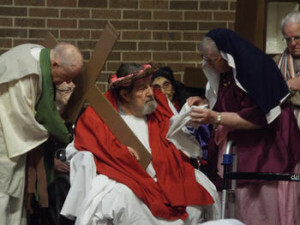 Every Monday, except on the Resident Council Meeting Day, Sr. Clare and the residents read and share excerpts from the Bible as applied to our lives.